Dulux Weathershield BackPack Roller System | OhGizmo! By Andrew Liszewski on 06/23/09 • Leave a comment! 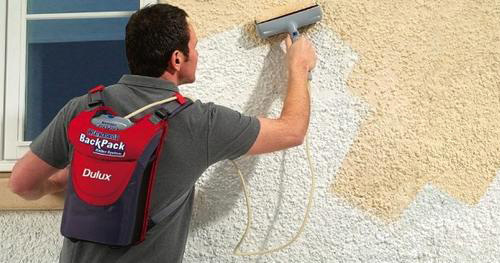 I don’t really see what’s stopping you from using this indoors, but the Weathershield BackPack Roller System from Dulux is actually designed to be used for sprucing up the outside of your home where ladders and hard to reach places makes painting particularly difficult. So the company’s smooth masonry paint comes in a special container that integrates into this backpack roller system along with an electric pump and a hose-fed handheld roller. Loading the roller with paint is as easy as clicking a trigger, and being able to wear all of the equipment on your back means you’ve always got a free hand for steadying yourself while on a ladder or when going all Spiderman on the outside of your home. The Weathershield BackPack Roller System will set you back about $80 while the Dulux smooth masonry paint starts at about $34.